Huawei Mate 10 Pro B146 (8.0.0.146)) ,but my phone is still on 8.0.0.132!somebody nose something about that? Hi @ghena777 questions about updates pop up quit often here on the forum. I don't know the specifics of your phone but from other topics like these https:// i learned that updates don't come globally but come in batches per continent or country. only farmstead cheese is cheese. Sorry to hear about the update delays that you are experiencing with your Mate 10 Pro phone. As jaap already mentioned, the update packs are released in batches for our devices, so not all of them are receiving the updates at the same time. Nevertheless, I can check the exact update status of your phone for you. If you would please be so kind as to send me a private message with your phone's IMEI number? To send a private message, simply click on my name in the discussion post and, in the new window that appears, select "Send message". Please do not post any phone details on this discussion. Hi.if really i wait like you for update,i dont no when is gonna hapens this,but a most of information about update to android Pie is after 16 october,they say.it everythink what i know about this! P.S. Re-edite your text and delete you Imei! I just deleted your IMEI. Remember that it's against community guidelines to post personal things such as your IMEI. Thank you for paying attention and noticing the IMEI! Next time you can flag the reply and I'll get a notification. I've moved this conversation to PM. We will continue the conversation there. I was wondering whether you found out when to expect an update? 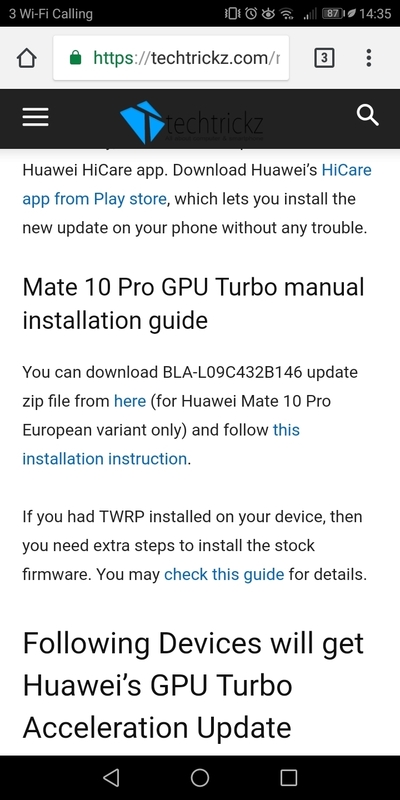 My UK mate 10 pro bla-l09 is also still on 8.0.0.132.